I have a mission. Well, I have more than one, but this specific mission is to demystify after-death communications. I think there’s way too much mystery around Afterlife contact when instead it should be a natural part of life. The Afterlife and Life after Death are actually misleading terms. There is only Life, and the part of life where we are in spirit does not take place after the physical life, but rather during. We are always spirit. In my view, contacting and communicating with people who are no longer (or not at the moment) in a physical body should not be treated with greater awe, fear or respect than communicating with people who are physically alive. In the same way that you wouldn’t be afraid to call a physically living person on the phone, you don’t have to be afraid to “call” a deceased person, or have a whole other respect around it. The other person may not “answer the phone”, or there could be connection disturbance, but you can and may always call them. After-death communications is being in contact with a human or animal who used to live here on earth in a physical body. The fact that they’re no longer focusing a part of their awareness into a physical body does not mean that they’re no longer conscious, and so it’s still possible to have a connection with them. Is it hard to get in contact with a deceased person? Yes and no. For some people it’s really easy. They see and communicate with deceased people just as easily as people who are physically alive. But it’s not that easy for most of us. Others have learned and trained it for a long time and have become really good at it. Some of those work as mediums. Some people are easily in contact with people they have known personally, but are not in contact with deceased people they didn’t know. But my short answer to the question “is it easy” would have to be: Yes, it is. It’s so easy that it’s hard to believe that you’re really doing it. And that makes it, well, difficult. Because often it’s very subtle, and as I said, for most of us it’s not as clear a contact as the contact with a physically living being. Can you get in contact if the person has reincarnated? Yes, no problem. It may sound strange, but if you consider that we are always spirit, even when a part of us is focused into a physical body, then you’ll always be able to contact the part that is spirit. Energetically nothing disappears, so the personality who once existed as a specific physical human being will still exist on a different level. It’s not the same personality that is reborn, but a different aspect of the spirit who has that personality’s experience at their disposal. I can recommend reading more about it in Bruce Moen’s books. I have heard that I cannot or should not contact a specific deceased person – is that true? Nope, go ahead and “call them”. 🙂 I know that a lot of mediums claim that they can only contact whoever wants to see you when you go to contact them, but that’s probably more about them not wanting to (understandably) guarantee it or get your hopes up if for some reason that person doesn’t “pick up the phone” when they call them for you. There’s absolutely no reason why you shouldn’t give it a try. Can you guarantee that I can contact a deceased person? No. In the same way I cannot guarantee that you can get in touch a physically living person when you try, I cannot guarantee that you can get in touch with a deceased one. Unfortunately. What is your own experience with Afterlife contact, Anja? I lost my father in 1997, and since then several mediums/clairvoyants told me that “he was around” when I talked to them, and that he was looking out for me. And that was good to hear, but … it didn’t really sink in as true knowledge with me even though they were able to tell me things they couldn’t possibly have known without actually talking to him. It wasn’t until I spontaneously got in contact with him myself during one of Bruce Moen’s workshops in 2010 that I really felt and understood it. I want to give other people that experience too, and that’s the reason why I’m teaching Bruce’s method today in various forms. In Bruce’s workshops I have also been in contact with other people’s deceaced loved ones, and that’s how I know it’s easy. But I would much rather teach you how to do it yourself than to make contact for you, because I think that’s much more valuable. (And I am not one of those highly trained mediums.) It wasn’t until I was in contact with him myself, that I really believed and felt in my heart that he was there. How do I learn to get in contact with a deceased loved one? The teachings I offer online are only in Danish so far, but I’m working on a translation. 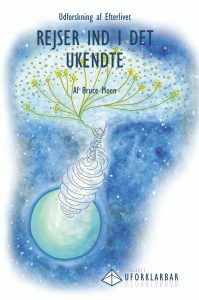 I am, however, certified to teach Bruce Moen’s Exploring the Afterlife workshop, so contact me if you want me to do that in your country (in English, of course). In February I’m doing that in Italy. Contact my host Davide Rozzoni to get more information about that. And you can read why, although it’s easy to do on your own, you should attend a workshop for it here: Why participate in a workshop when I can do it all at home? You make it sound so easy. What makes it so hard, then? Doubt! As Bruce Moen used to say: “it’s so easy that the hardest thing is to believe you are doing it”. The only way to get rid of the doubt is to practise and to ask for proof every time you do it. Practice contacting people you didn’t know – that will make the evidence stronger. Some times you will not doubt the contact at all, but if you do, then ask the person to show you or tell you something that you couldn’t possibly know without actually having spoken to them. If later you can then verify that piece of information, that’s stong evidence that you have actually been in contact. The more evidence you gather, the weaker your doubt will get. No. It’s loving communication with people close to you. As with anything else in life, of course it’s a good idea to get to know the area when you move into foreign territory, but it is no more dangerous than it is harmless. The fact that some people have had terrifying experiences with ghosts etc. doesn’t mean that it’s a dangerous field to move into. It just means that someone was scared of something they didn’t know what was or how to handle. Do you remember the first time you were home alone as a child and got scared of something in the dark? But then when your mother came and turned on the light, it turned out that there was nothing to be afraid of? It’s a little bit like that with contacting the non-physical. Fear and ignorance can negatively impact our experiences. These were some of my answers to frequently asked questions and myths about after-death communications. I’d love to hear your comments and experiences below. Remember: All of the above are my beliefs and experience. If you have a different experience, and your gut feeling tells you something else, then please do listen to your own guidance. I’m not here to convince you, only to encourage you to explore things on your own.